I think you're looking at a stereotype of the month entry here. Hello. My name is Norma Sullivan and I live in SW Lower Michigan. My grandchildren have been attending VBS this week at a local church, and we are e-mailing you to request your assistance in regards to a flyer that was made up by a local church for VBS (Vacation Bible School). First, a little background. Friday the children brought a couple of papers home with them from the church. The first paper was an invitation from the church for the parents to join the children for a chicken bar-be-que for the final day of VBS. It also told that the kids would get to go to the "cowboy toy store" to spend their "gold nuggets", and that "the kids will be presenting a small program of what they have learned." Great, we thought, sounds like the kids have been having a lot of fun. Then we read the second paper. This paper was made up to mimic an old-time newspaper called "The CowTown News". Immediately under the "newspaper's" name it stated: "Wanted! Children after God's own Heart!" Still no problem. Main headline: "Indian Uprising! Is CowTown Next?" Uh oh, sinking feeling, and the feeling didn't get any better after reading the rest of the "newspaper". I talked to the pastor of the church on the phone and told him how I felt about this flyer, and was assured that, that was "not" the intention of the flyer. What I was told was that the children were doing a biblical re-enactment, but put in a different setting, and that the "Indians" were actually the "good" guys and the Sheriff was the "bad" guy. (David and King Saul, hence the name, "Sheriff Saul".) We do plan on attending the presentation to see for ourselves how it will be carried out. This is where we could use your assistance. We are seeking people to send letters or e-mail to the pastor of this church explaining how this is racist and hurtful. The pastor seemed to be a nice person, and was willing to listen to my views. We respectfully ask that all correspondence be polite and tactful. It is NOT our intention to stir up trouble, it is our intention to "enlighten" or "educate". Please forward any correspondence to us at the above mentioned e-mail address. We will print out the correspondence and personally deliver it to the pastor. Please don't wait, send your e-mail today! Please feel free to copy and/or forward this e-mail to anyone that you feel may be interested in helping us with this cause. WANTED CHILDREN AFTER GOD'S OWN HEART! INDIAN UPRISING! IS COWTOWN NEXT? Attacks on the remote Ranches and Farms have created panic in Cowtown. Indian raiders have been stealing livestock and burning homes. 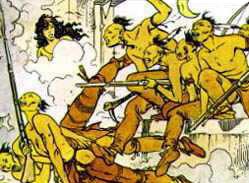 The Savages are probably disgruntled Indians from the Reservation. What exactly has motivated this return to the warpath is not clear. Residents of the Cowtown are expecting the preparing for a possible attack. Reports have come in that Davy the Outlaw has joined up with the Indians. Sheriff Saul says that unless he intends to teach them how to raise sheep, it may only be more trouble for area ranchers and farms. Davy is still a suspect in the Cowtown bank robbery though some local people claim he is innocent. Sheriff Saul is organizing a local Militia to ride out and bring to an end the Indian uprising. Brave Cowboys, farmers and merchants are encouraged to join. They must supply their own horses, arms, food, water and ammunition. Muster at the Sheriff's office at noon today. SARSPARILLA ON THE HOUSE FOR ALL INDIAN FIGHTERS! The local chapter of the Carrie Nation Temperance League will have a rally to protest the opening of the saloon on Friday evening. The Cowtown's Women sewing circle will supply tea and cookies . It is recommended that the protesters leave their husbands at home, and that they bring their own signs to help remove this blight on our fair town. Snidely says he is not scared! Cowtown's women will see. They expect this rally to be a "smashing" success. Ms. Sullivan may not want to stir up trouble, but I don't mind. As far as I'm concerned, enlightening/educating and stirring up trouble are the same thing. You rarely can do one without doing the other. Unless I missed something, that part didn't make it into the flyer. The Indians seem to be the bad guys there. Militia men...no doubt braying their Second Amendment right to shoot rustlers. Just what we need more of.